It features two partner events: ITHMAR15, dedicated to Tourism Investment in the Halal Travel Sector and TURATH15, focusing on cultural tourism experiences. The new feature instantly calculates the prayer times for the current location, the distances for nearby mosques and the time it will take to reach them. There is significant opportunity for Canadian exports of beef, seafood, and speciality food products such as organics and gluten-free in the UAE grocery retail industry. 12th Malaysia International Halal Showcase (MIHAS), and six focused forums – is scheduled to be held from 30th March to 4th April 2015 at the KLCC in Malaysia. The conference was graced by renowned scholars and eminent personalities from the travel and tourism industry from Auckland, India and other South East Asian countries. EXPOHALAL SPAIN 2015 will turn Madrid into the European epicentre of the Halal industry during two days, October 21 and 22, 2015. The Muslim tourism market grows annually by 8.5%, making Spain the sixth highest destination chosen by 23% of these travelers. The report, the first carried out jointly by Crescentrating and MasterCard, involved 81 non-Muslim country destinations and 29 Muslim nations. 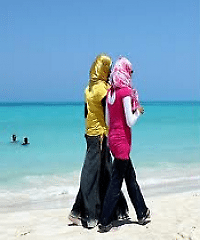 Halal tourism is a fast emerging concept in the tourism industry that offers a range of holiday packages adhering to Islamic beliefs and practices. The TAT will invite about 100 tour agents and Muslim-related media to Thailand in the middle of the year when it will organise the Thailand Travel Mart 2015 from June 3-5. Iran plans to turn to the world’s hub for Halal tourism which could draw as many as 15 million Muslims a year from around the world, a top official says. Lombok is at the centre of an Islamic tourism drive in Indonesia, which has the world’s biggest Muslim population and is hoping to boost the number of visitors. The rapid growth of the Muslim population creates an unrivalled revenue growth opportunity for travel and tourism. Halal travel in all forms is now booming. They want to know if I eat Halal food – Should I Be Worried? Booking a Halal meal on your next flight? The new European commission on counter-terrorism will be taking notice, and keeping records for 5 years. Those ordering halal food while travelling into/out of Europe could be now be “food profiled” for secondary security screening or possible worse not given halal food while in detention.